Long work days during summer mean when I finally get home, I’m feeling more exceptionally lazy than usual. So for cocktails, that calls for simple classics that I can make in my sleep. Either that, or those kind of drinks you see being made in the background scenes of Mad Men where ladies with curves and men in suits casually slurp down tall ice-filled glasses of hooch and soda – highballs. Anyways, Mad Men got me thinking of the Moscow Mule, created in the 1940s, which combined vodka, lime and ginger beer in an ice-filled copper mule cup. It is credited with playing a large role in shifting American liquor tastes from gin to vodka, a shift that started in the 1950s until the early 1960s, at which point, the Mad Men timeline picks up. Which brings me back to the ginger ale, citrus and liquor of the buck or mule. Bucks are a breeze to make and highly forgiving of just slapping one together with eyeballed measurements. The real danger is how easy they go down – you can quickly knock a few of these back over a summer BBQ and before you know it, you’ll understand its name. Shake with ice until frosty & strain into Mason jar filled with ice. Top with ginger beer. Aperol, Aperol, Aperol! I’ve gone a little nuts for this sweet little aperitif from Italy. Aperol was originally made by the Barbieri company in Padua, but has since been added to the Campari family of products. It dates back to 1919 and includes a number of herbal components including bitter orange, gentian, rhubarb and cinchona. Its flavor profile is sweeter and less bitter than Campari with a pleasant, almost floral, orange taste and half the proof. It makes for a good entry into this glass of aperitifs, especially for folks who might find Campari too bitter. Plus, it just rolls off the tongue! Stir with ice and strain into cocktail glass. Garnish with orange twist. Its turned into summer and that brings the hankering for floral, fruity digestables. I made a batch of lavender syrup a few weeks back and came up with a Lavender-Ginger Collins that was quite tasty. However, I had a pile of leftover dried lavender even after making the syrup. So what to do? The answer, of course, was to make more syrup! This time, a honey-lavender, with a tasty drink courtesy of Liquidity Preference and Mixology Monday. It was both refreshing and addictive. I feel a classic kick coming on. Last night it was Manhattans. Tonight it was “what to do with the leftover mint? Juleps!” Not that I am complaining mind you – I always love a good excuse to thwack a bag of ice with a rolling pin. 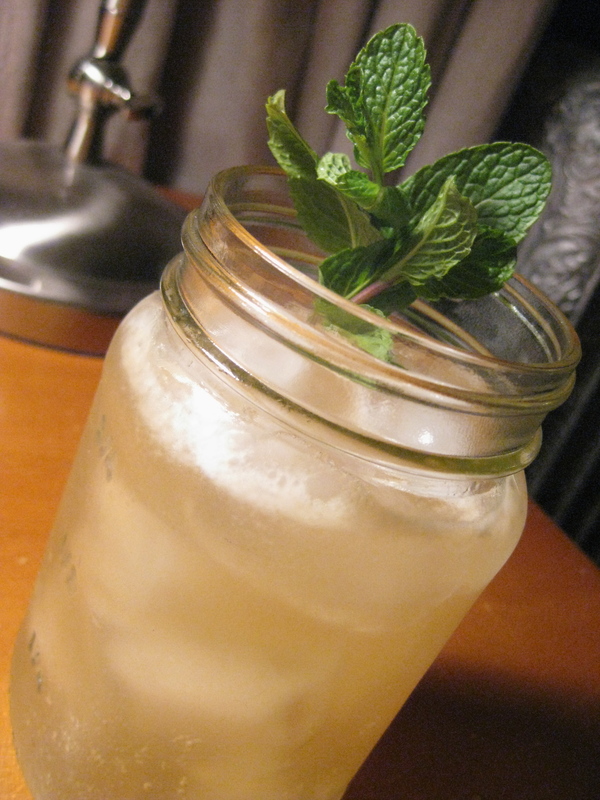 Put mint leaves in bottom of highball, double rocks glass, or if you are special – a silver julep cup. Muddle gently to release mint oils. Add simple syrup and a little of the bourbon. Swirl around. Cover with crushed ice. Pour rest of bourbon on top of ice. Stir gently. Add more crushed ice to make a mound. Garnish with large sprig of mint. Add a short straw or two. Sip like you have an obsession with seersucker, magnolias and the Waffle House. Combine all with ice and shake like the dickens. Strain into coupe and garnish with raspberries. Saw this one on the menu at the recently revamped 15 Romolo in North Beach. (Great little watering hole.) I jotted down the ingredient list on the trusty iPhone and made a best guess as to the proportions, using a basic whiskey sour (sans egg white) as the baseline. Next time I think I will pull back a little on the lemon juice and let the bourbon and Benedictine play a more forward role. Still, a nice little tipple.